Throughout Oregon Wine Country, flowers have blossomed, buds have broken and the summer tasting season has begun. To find the right music, I think I need first to look at individual songs. It would be fun if they were wine-related. Let me see what I can find. Organic, biodynamic or LIVE? What makes most sense? Summer has definitely heated up. As I write this letter, it is 100 degrees outside and, except for the few masochists, everyone looks melted, like uncomfortable versions of themselves. As you turn the pages of this issue, you will notice some of our departments are missing—Value Picks, Wine 101, Commentary and so on. No worries. They will be back in February. 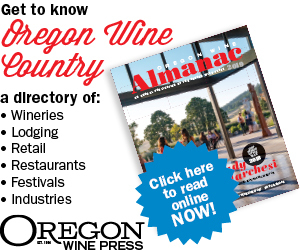 I am not directly involved with winegrowing but I am an avid wine drinker, a supporter of Oregon wines and an interested reader of your publication. I couldn’t help but notice the glaring falsehood that was stated in the guest column by Evan Bellingar in the August 2009 Oregon Wine Press. Before you read this issue of the Oregon Wine Press, you may want to find a napkin, because I have feeling you will salivate; and this ink will smudge when wet. The leaves are turning, the weather is cooling, and I couldn’t be happier. While I do enjoy sunshine on my face and garden-fresh tomatoes, I am always grateful when the summer ends and fall begins.